Very Powerful Concentrated Fragrance Oil! Trinity Candle Factory Premium Scented Fragrance Oils - 1/2 oz. - Concentrate. This fragrance oil can be used for many things including wax cube refresher oil, fragrance warmers, oil warmers or diffusers, light bulb rings, refresh your candles if needed. etc.. This scented fragrance oil is a very strong concentrate it does not take much. Our fragrance oil glass droppers fit these Fragrance Oil Bottles. Cherry Vanilla - Fragrance Oil - 1/2 oz. If you like the smell of Leather you will LOVE this scent! Awsome!! I have worked with a lot of oils, and yours are some of the very, very nicest I have found. Wonderful scents, no chemical undertones, WELL WORTH EVERY PENNY. My friend recommended the honeysuckle oil to use in my diffuser and I'm so glad I got it. All of the scents I have tried have been amazing and make the entire room smell great. Trinity Candle Georgia Peach diffuser oil is the absolute best peach fragrance available anywhere! I searched high and low for an authentic peachy smell for my home and this one is the winner. 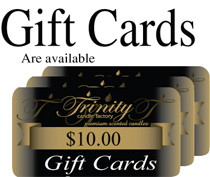 Trinity Candles have the Best Product. I ordered the fragrance oils to make sachet pillows to put in my dresser drawers. They are extremely fragrant and last for months. I will be ordering more. smells great. Have enjoyed all the products that we have purchased from your company. Thanks! This one of the best smelling oils. I put some in the warmer, and within minutes, it has my entire living and dining room smelling awesome. I will definitely be placing another order very soon. Great product you can smell it all thru the house my husband loves it too. I love the Lemongrass fragrance oil - it is awesome!!! It makes your home smell like your in a spa. It is very soothing. I first smelled this scent when I was in Jamaica a few years ago and when I returned home, I've been using this fragrance ever since. Unless you dislike lemons, you can't go wrong with this fragrance.